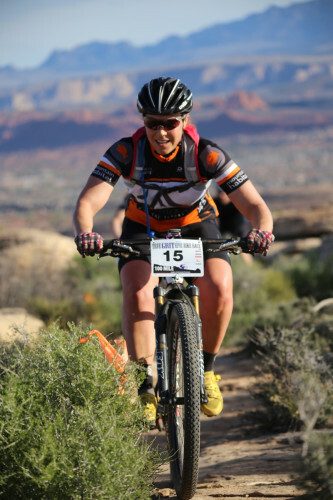 On Saturday, March 14, 2015, I lined up for the True Grit Epic in in Santa Clara, Utah, one of my favorite endurance races in the US. I was a little anxious but mostly excited to take on the 2 lap, 88-mile race, the first race of the 2015 National Ultra Endurance Series. For most of the 350+racers, it was the first opportunity of the season to escape dreary, cold and snowy weather and spend a day riding excellent desert trails in sunshine and warm temperatures. Coming from a long winter in the Tetons, I knew the first long ride of the year would be tough and yes, require a lot of grit. The last time I raced the True Grit was in 2012, the very first edition of the 100-miler (when it was a true 100-miler). It was my first time riding in Southern Utah so the trails, the riding, and the course’s high degree of difficulty were all surprising. There was little pressure and few expectations that day, mostly because I was the only female who attempted the 100-miler! It was a brutal day on the bike. A large group of us took a 30min to 1-hr detour depending where in the race you were because of some deliberate course marking sabotage. I suffered a lengthy flat tire and also remember getting lost during the pre-sunrise start because we didn’t have a pace car…or lights. It was almost a 10-hr day for me. But, I mostly remember how much I loved the technical nature of the course. Broken ribs and a bad back have kept me out of the race the last 2 years, so I was really excited to return. Fast forward to 2015 and a lot has changed. The True Grit Epic has progressed and improved dramatically in a short amount of time. Participation numbers were up significantly and so was the event’s quality. The course layout was changed to eliminate confusing lap layouts, the later start time offers ample daylight, course markings were excellent and aplenty and the start and finish line amenities were fantastic. The finish rewarded weary racers with good food, beer, and live music and offered a comfortable place to recover on the perfect, cushy grass on the Santa Clara Town Hall lawn. Cimarron Chacon put together a totally dialed event with a great vibe, start to finish. As the race has changed significantly, so has my personal life and approach to racing. When I first took on this race in 2012, I was a full-time pro working on my graduate degree, spending much of the January and February training in Tucson. I had huge miles in my legs and by body was conditioned to hot temperatures. I stopped racing and training full time back in 2013 and now spend a lot of time coaching skills and running camps. This past fall, I stopped managing the Wydaho Mountain Bike Festival to start a new job as the Executive Director of Mountain Bike the Tetons, an IMBA chapter. With all these changes, I didn’t even decide to race this year until February when an amazing company, Luca Sunscreen, agreed to become my title sponsor. I’m also riding as Grand Targhee Resort ambassador and am so grateful to have found supportive partners who value my new, more balanced approach with work in advocacy, coaching and racing. When I registered to race, I knew I wasn’t prepared, but who ever really feels ready? If we always waited until we felt 100% ready, we’d miss out on a lot of opportunities, in life, work and in racing. I’d always rather try than not and my True Grit experience solidified that regardless of fitness, life circumstance and preparedness, it’s always better for me to race than to sit out. It just required an attitude adjustment pre-race to set myself up for success. When the gun went off, I was mentally prepared to be off my normal race pace. Having raced over twenty 100-mile races in my career, I know the mental toll these races take, the progression of negative thoughts that can sneak in if you don’t take control over them early on, the tricky balance of pushing hard and easing up so you don’t cook your brain or legs. I set an intention for the day with my lack of fitness in mind and no matter how good or badly it was going, I knew it had to be my head that would pull me to the finish. Every time I do a long race, I relearn that my thoughts create my experience. Deep down I know I have 100% control over my emotions and that a positive thought loop will create a positive experience whether the race is going well or poorly. Years of experience that has taught me this, and although my Master’s Degree in Sports Psychology supports this approach, it’s certainly more derived from practice makes perfect than any degree or psychological theory. So, although I’ve ridden my fat bike a lot this winter and went in mentally prepared, this race experience was a huge eye opener that casual fat biking doesn’t translate to mountain bike race readiness! What caught me the most off guard and was that things that normally never hurt were crushing me. No time on the real mountain bike this winter mean that I had no calluses built up on my palms, so my hands were burning all day. I had hot foot for the first time ever in an endurance race. My knees ached and my back was really unhappy. I felt really sensitive to the mid-80s temperatures. I can guarantee I wasn’t alone in these feelings, but wow, there was a lot going on at once all day. For the nitty-gritty of the race details, a small but strong field of women lined up for the all-day beat down. 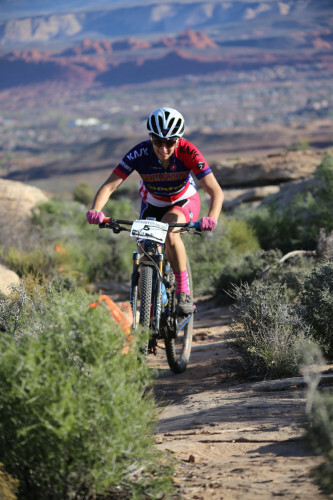 The eventual race winner, Sonya Looney, brought fantastic early season form and skills to True Grit, just having just completed a 6-day stage race in southern Spain 2 weeks prior. As we weaved our way through the first sections of double track with the Master’s and Single Speed men, she opened with a race pace that I quickly realized I wasn’t going to even try to sustain. I knew my likelihood of blowing up was 100% if I went into the red early, especially as temperatures rose throughout the day. I stuck to my plan of strong, steady and conservative, settled into a pace I thought I could sustain, a pace I kept for the entire 88-miles. The gap between us opened up to almost 9 minutes by about 3 hours in and was only about 11 min by the end. So if anything, my strategy kept me from blowing up! However, in retrospect I really wish I had pushed my pace harder earlier on, but then again, maybe I couldn’t have sustained it. As the temperatures increased into the mid-80s, my winter-conditioned body started to feel the heat and I simply couldn’t push any harder. I ran out of water a few times between aids and was amazed at how much more fluids I was going through than normal. I lost a lot of time lingering at aid stations looking for my drop bags and generally being a space shot, which is not at all normal for me – boy, was I was race rusty. But, other than the fact that I lacked fitness and uphill speed, I was riding well and downhilling fast. I cleaned almost 100% Zen loop both times. I felt comfortable and confident in all the technical bits, took the hardest lines and barely got off my bike all day. I rode happy. In the end, I was stoked with my 2nd place finish, a happiness not at all related to the outcome of the race. It was a fantastic day because I rode sweet, interesting and really challenging trails in beautiful, warm weather for 8:16 and didn’t think about work or snow once all day. I saw so many friends I hadn’t seen in a long time and was really excited for Sonya and her strong performance, especially because she had a mechanical in this race last year. Most importantly, I was reminded that racing makes me happy, serves as a major stress relief and is the only time in my life that I truly live in the moment. When you’re mountain bike racing there simply isn’t time to think about anything else. That’s what I appreciate the most about these events. The focus and mental determination required leave me a unique brand of exhausted – mentally spent, physically beat down yet buzzing from just completing something that is equal parts fun and over-the-top challenging. For me, it’s a high that can’t be replicated outside of racing. Although my life has changed from when I was the NUE Overall Champion in 2011 and 2012, so has the True Grit. It’s improved dramatically over the years and has become a must-do event on the endurance racing calendar. Like racing, life would be pretty boring if things always stayed the same.